"Bushy eyebrows, faces and legs are a breed characterestic of these wonderful animals. Giving them a "babydoll" appearance. 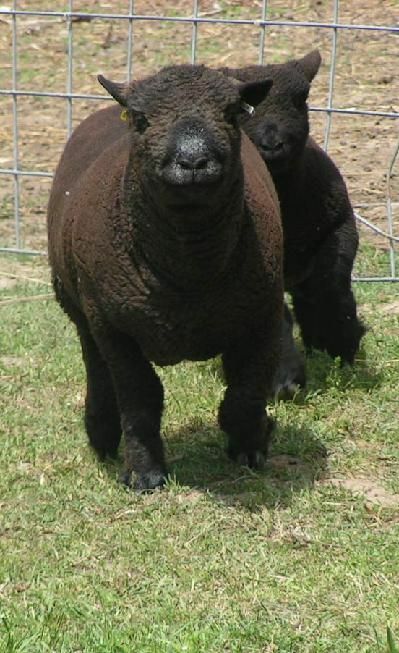 They are one of the oldest known purebred sheep in the world." We have two breeding pairs available, WHITE with black grandfather. Sold as pairs only. 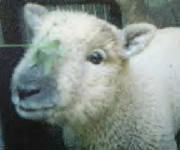 Registered with the Olde English Babydoll Southdown Association. One Great Pyrenese Female for sale $100. Adult female 7 years old. Great with children and animals. Has been outside but was originally inside, unknown if housebroken at this point. Her mate has passed away and we now want a loving home for her. 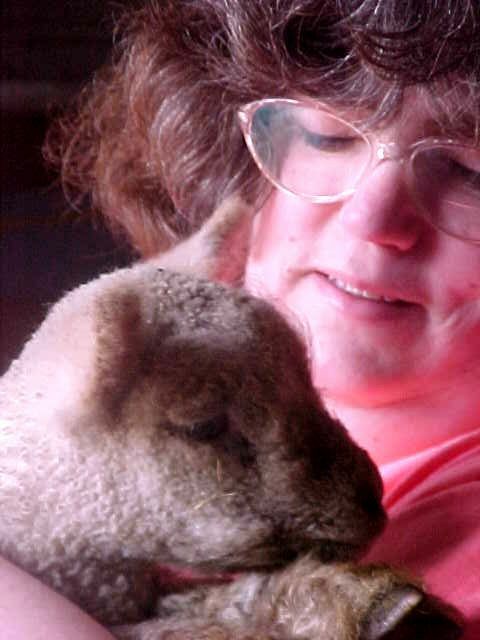 We live on a small hobby farm in southern Michigan with our two children, sheep, mulefoot pigs and pyrenees dogs and various other farm animals. Our farm is not extremely elaborate but we find it fits our needs perfectly, and are very proud. We currently have approx. 25 ewes and two rams, 2 white 2 black. 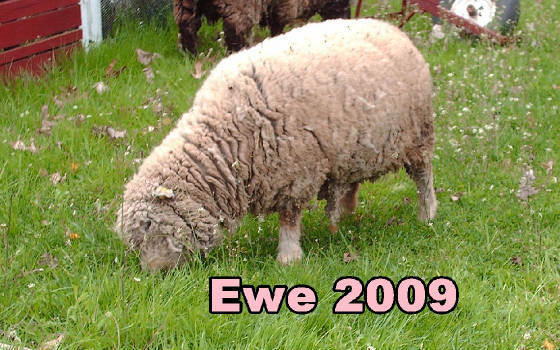 We have raised the Olde English Babydoll Sheep breed for many years. We strive to maintain the "true type" southdown preserving the smaller size and muscle mass. Visit one of our links above for further information including but not limited to: cost, reservations, history, health care, photo pages, wool and more! 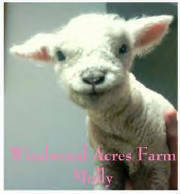 We have five finn/babydoll lambs for sale! We list our rovings and yarn on Ebay when available! 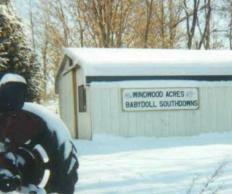 Our Windwood Acres email is not working properly all the time , please use our gmail address until we can get this problem resolved...THANKS! First year using him 2008- beautiful babies! We have been published in the wool & fiber issue of Small Farm Today magazine, as well as Countryside Small Stock Journal & Rare Breeds Journal! 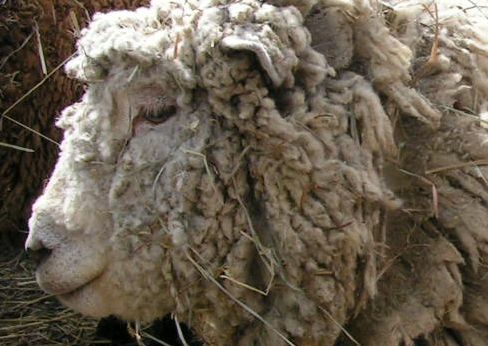 Our fleece won Reserve Grand Champion at the Michigan Fiber Festival in August 2002, Reserve Grand Champion, 1st, 2nd, 3rd at the 2003 Michigan Fiber Festival! 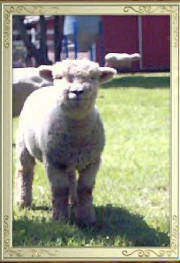 Consistent quality a southdown trait! 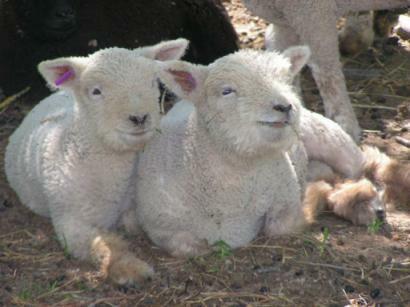 We have purchased Sunshine Farms, located in Middlebury Indiana, (from one of the three original founders of the Olde English Babydoll Sheep Association) entire herd of ewes. We believe these to be some of the finest specimens in the country today. This economical barn was constructed from the carports you see along many roadways, due to its 5foot side height my husband and I built this with no outside help as the company erected the frame and top. We opted to add the siding vertical and installed sliding pole barn doors on each end. It has a 6ft aisleway, allowing our lawn tractor ample room for easy cleaning of the pens, it has a row of 4X6 lambing pens on each side. We chose the 18X40 foot size. Demand far outweighs supply, reserve early!